Off-line Finishing | Quad Infotech Inc. The QMOS off-line finishing module provides a complete suite of tools to plan, schedule, manage and record operations of its various finishing lines which can include straightening, polishing, mult-cutting, heat treating, bar turning, NDT operations, cold drawing and more. At each stage, bars entering and exiting the operation are tracked, process recipes and control variables are relayed to the operators, delays are tracked, losses recorded and output material is automatically queued to the next operation. Bundles can be received from the mill or an outside source, processed at various stations based on a defined schedule, reworked due to an upset condition, sent to an outside processor, received yet again, machined, tested and shipped to customer with full end to end genealogy, process parameter and test result visibility in QMOS. In the bundling area, QMOS does automatic piece count calculations for all products. QMOS reads scanned tags of individual bundles being fed to all finishing work centers, enabling precise tracking of bundles through finishing processes and warning when restrictions are applied. Bundle tracking is done throughout the production process all the way to material shipment. Interfaces with various scales, delay triggers, NDT signals, test equipment allows for easy classification of material and delay tracking. This information is used in detailed process and quality analysis tools and reports. The integrated quality control functions allow interfacing with various test equipment to receive test results for hardness, jominy, micro-cleanliness, portable spectro chemistry, tensile and more. The active sample results are compared against the internal control limits and material is evaluated at each step. The results are displayed to the operators in real-time allowing them to modify variables affecting the results or take corrective action. If the sample results are outside the specs, heats will instantly go on Hold. Certified results are sent to Level 1 ERP to appear on the Material Test Report (MTR). QMOS provides step by step instructions for each work area to ensure all process steps are followed as intended. Operator sign off features ensure full accountability by the operational crew towards the performed tasks. Detailed shift reports provide a comprehensive look into all activities of the shift such as production, consumption, delays, performance, crew details, process recipes, test results, notes and much more. The analytical tools provide additional capabilities to slice and dice the data in order to look for specific information or trouble shoot problems. Once production is complete, the results need to be reported back to the ERP system. 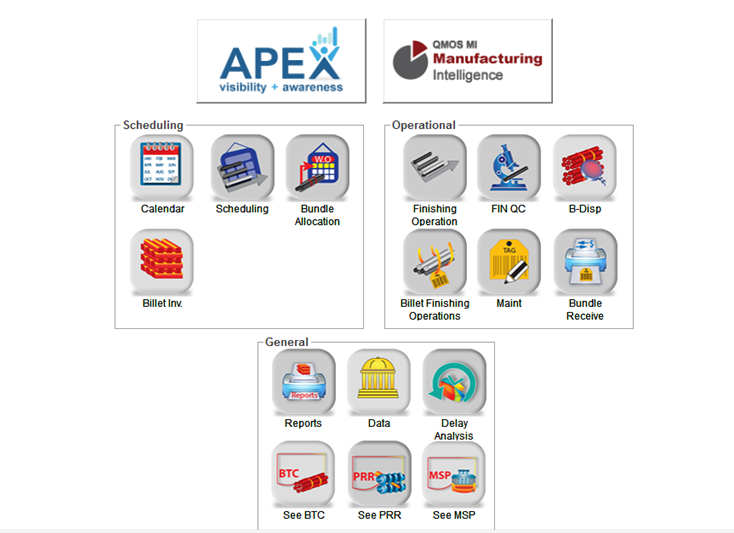 QMOS interfaces with a wide range of industrial ERP systems such as SAP, Oracle, Ross, AS400 and more. The QMOS confirmation process can manage any ERP configuration variations and confirmation requirements. QMOS has its own proprietary interface management system (IMGUI) to facilitate the monitoring of the interface and resolving any issues immediately.